With over 400 lakes in a 50-mile radius, 150 resorts or campgrounds on their shores and acres of hardwood forests, the Brainerd Lakes Area is the ideal destination to view Minnesota fall colors. Typically, the fall colors in the Brainerd Lakes area are experienced in late September to early October, however, Minnesota fall colors and their peak color displays change each year according to precipitation and temperature variations. Minnesota’s Department of Natural Resources has some excellent information on their website that will guide you as you plan your fall leaf viewing trip to the Brainerd Lakes Area. If you are adventurous, you can simply get on any road leading north of the Brainerd area and you are likely to find a brilliant show of color. 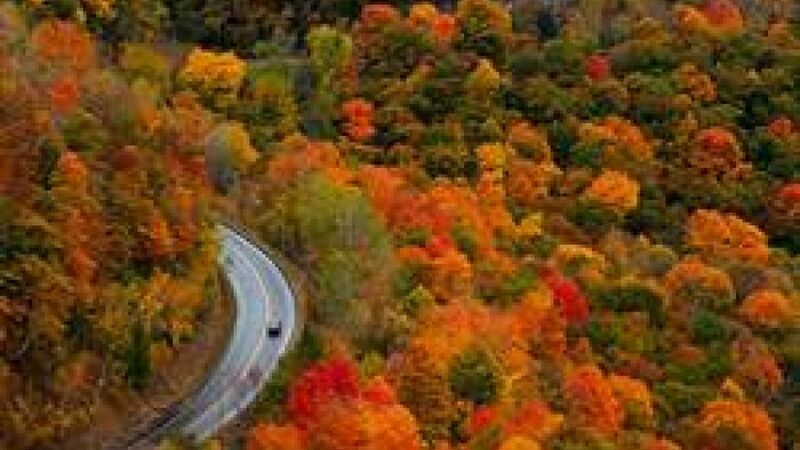 If you like the more structured approach, below are 5 suggested driving routes that showcase the Minnesota fall colors in the area. From the intersection of Hwy. 371 & 210 in Brainerd, go north five miles to County Road 77. County Road 77 takes you west to the south shore of Gull Lake and will circle the entire lake. On this road you will pass many of Brainerd’s most famous and historic resorts and golf courses including Cragun’s Resort, Madden’s, Kavanaugh’s and Grand View Lodge. The Brainerd golf courses include Cragun’s Legacy Courses, Madden’s Classic, and Grandview’s Pines and Preserve. It is worth taking a short detour off Country Road 77 to drive through the golf course grounds and view the beautiful fall flowers and trees. You will also notice Pillsbury State Forest on your left as you are driving around the west side of Gull Lake. As you continue to make your way around Gull Lake, you will see a sign for County State Aid Highway 1 (CSAH 1). CSAH 1 goes east from County Road 77. If you turn right (west) at that point you will follow a minimum maintenance road to the top of Mount Ski Gull. The panoramic views from this vantage point are not to be missed. A palate of colors can be seen – the red, orange and yellows from deciduous trees, the green from evergreens and the blues from the sky and lakes. Continuing on County Road 77 you will travel through an area known as Sherwood Forest (the speed limit will decrease to 35 mph at this point). Here, the trees surround the road forming a brilliantly colored passageway of trees. As you approach the north end of Gull Lake you will see additional dining, lodging and recreational options as it takes you back out to Highway 371 on the southern tip of Nisswa. Pillsbury Forest Road is the southern-most forest road along County Road 77. The Pillsbury Forest Road offers three separate intersections to minimum maintenance forest roads that take you deeper into the forest. Stump Lake is located about halfway between County Road 77 and Walter E. Stark Assembly Area and Horse Campground. There is an 1886 homestead located along the horse trail that crosses the Pillsbury Forest Road on the northern end of Stump Lake. Approximately ¾ mile north of Pillsbury Forest Road is Beauty Lake Forest Road. There are 4 lakes visible from this road: Beauty Lake, Green Bass Lake, Dead Horse Lake and Long Lake. Two minimum maintenance forest roads adjoin with Beauty Lake Road. One of these is referred to as Walkingstick Road and leads to Shafer Lake and the Shafer Lake Day-Use Area. If you take County Road 1 north .8 miles, you will see Orchard Park Lane. Orchard Park Lane will take you to the northwest edge of Rock Lake where the Rock Lake Campground is found. There is a small hiking trail and a day-use area that includes a picnic and swimming area as well as boat access—all wonderful ways to take in the Minnesota fall colors. The Round Lake Tour will take you through a residential area where you will pass by Round Lake, North Long Lake and close to Gladstone and Little Hubert lakes. Follow Highway 371 north of Brainerd 12 miles to County Road 127. Turn east to wind around Round Lake. The Paul Bunyan Scenic Byway is a 54-mile driving route made up entirely of county roads that take travelers through 14 jurisdictions and two counties (Crow Wing and Cass); with hiking and walking trails, recreational parks and lakes, wildlife management areas, and historical artifacts. Crow Wing County’s State Aid Highway (CSAH) 16 is the spine of the Byway. At the intersection with CSAH 66, the route travels both north around the Whitefish Chain and south along the north side of Pelican Lake. It passes through 14 local government jurisdictions: Jenkins, Ideal Township, Crosslake, Manhattan Beach, Mission Township, Pelican Township, Timothy Township, Pequot Lakes, Breezy Point, Pine River, Jenkins Township, Gail Lake Township, Wilson Township, and Barclay Township. It connects with the Paul Bunyan Trail in four locations considered ‘gateways’, at CSAH 16, at CSAH 11, and at CSAH 15 in Crow Wing County and at CSAH 1 in Cass County. Currently, more than 100 resources have been identified along the 54 miles, resources that are valued for their cultural, historic, recreational, natural, scenic, or archaeological value. Bay Lake is located within Bay Lake Township, approximately 15 miles east of Brainerd, Minnesota and five miles (8 km) northwest of Garrison, Minnesota. Like many other lakes in the area, Bay Lake is surrounded by commercial resorts and private cabins, and is a popular destination for fishing, boating, and water skiing. The Ojibway called the lake Ses-sa-beg-a-mah, which has been translated as “lake of many bays” or “lake of many arms.” Access to the lake and resorts is via Minnesota State Highway 6 for the western shore and Crow Wing County Highway 10 for the eastern shore. There are three islands on the lake. The largest of these, the 72-acre Church Island, is used as a Lutheran church camp. Bay Lake is part of the headwaters for the Ripple River, and the river is a common spawning spot for fish. To begin your Minnesota fall colors tour of the Bay Lake area take County Road 18 east from Brainerd. Travel north on County Road 6 which will take you along the west side of Bay Lake. At the town of Bay Lake you will travel west on Tame Fish Lake Road NE which will take you along the north shore of Bay Lake eventually turning into County Road 10. As you are traveling south on 10 you will come to Brighton Point Road NE which you can follow south along the west shore of Bay Lake. As you continue along County 10 you will pass several small picturesque lakes including Lake Wilson and Partridge Lake. County Road 10 will come back to County Road 18 where you can travel back to Brainerd. For more ideas on things to do in Brainerd, Minnesota, like us on Facebook!